Clarence and Vickie met in Washington Park in 2016. 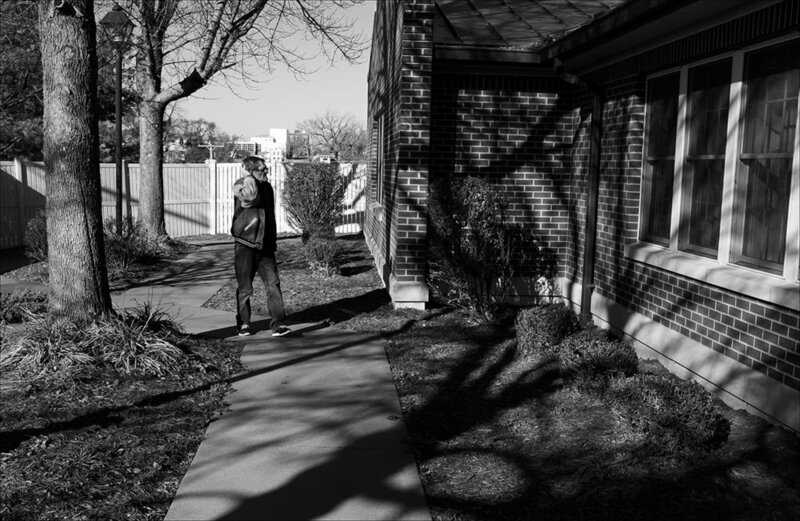 With Clarence at 5-foot-4 and Vickie at 5-foot-3, the couple is seen as the almost perfect pair as they walk around town. Vickie, 53, has difficulty remembering basic information, such as her parents’ names, and this makes it difficult to apply for financial or medical assistance. She has an appointment with a psychiatrist to determine her eligibility for disability. Clarence, 74, was a State of Illinois maintenance worker for 18 years. Before that he drove a taxicab for 15 years but quit after being robbed at gunpoint. He survived a car accident in 1983 that left him hospitalized for nine months. He receives a $930 monthly retirement check. December 2016: Clarence and Vickie walk home from a visit to the Catholic Ladies of Charity store where they received free clothing. 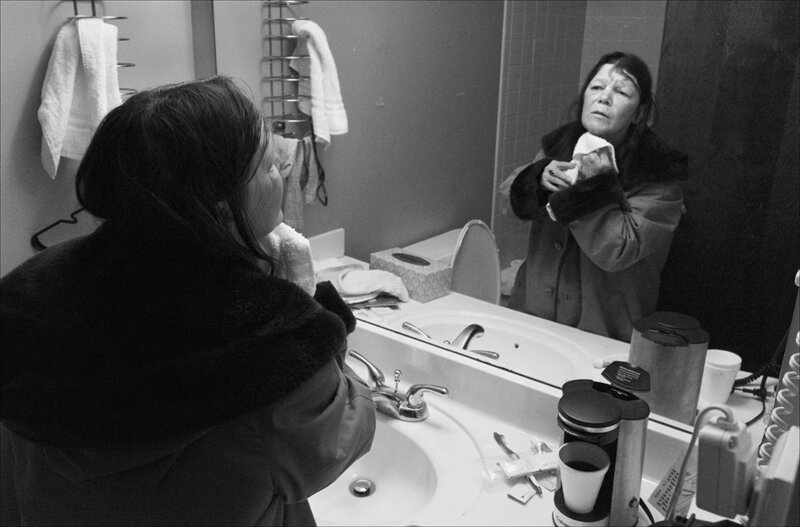 Many of the poor and homeless in Quincy do not have the money to use a laundromat, wearing clothing until it nearly falls apart, in some cases. They rely on Ladies of Charity for the clean used clothing that is offered from clothing that isn’t sold in the retail thrift store through a once per month voucher system. February 2017: Clarence enjoys a Valentine’s Day meal at the Horizons Soup Kitchen. “I’d like a steak at the Golden Corral, but I can’t eat steak. I lost my false teeth two years ago — my dog found them in a chair and chewed them up." 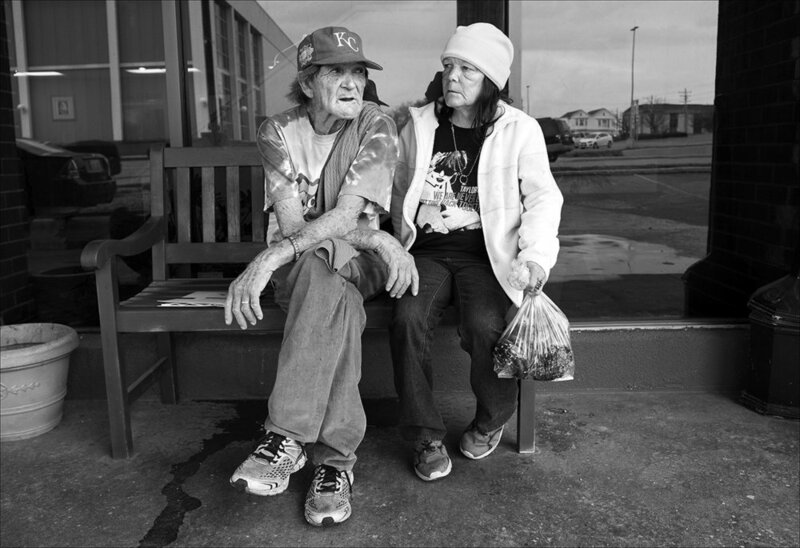 Although Clarence and Vickie rely on the Monday through Friday meals at Horizons, Clarence likes to take Vickie on a date out to eat, usually at McDonald’s on the first of the month after getting his monthly retirement check. 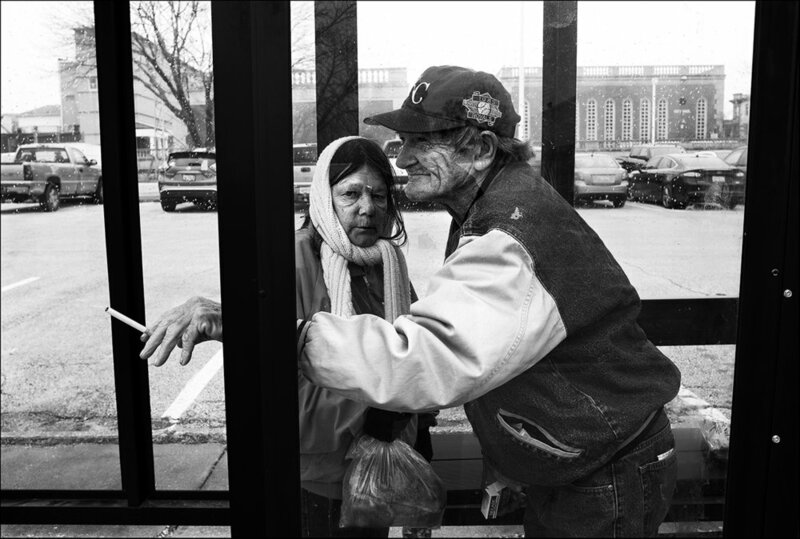 February 2017: After eating lunch at the Horizons Soup Kitchen, Clarence and Vicki wait for a city bus to take them to their motel room. Quincy public transportation is an important service for those living in poverty, as many are without any other form of transportation. 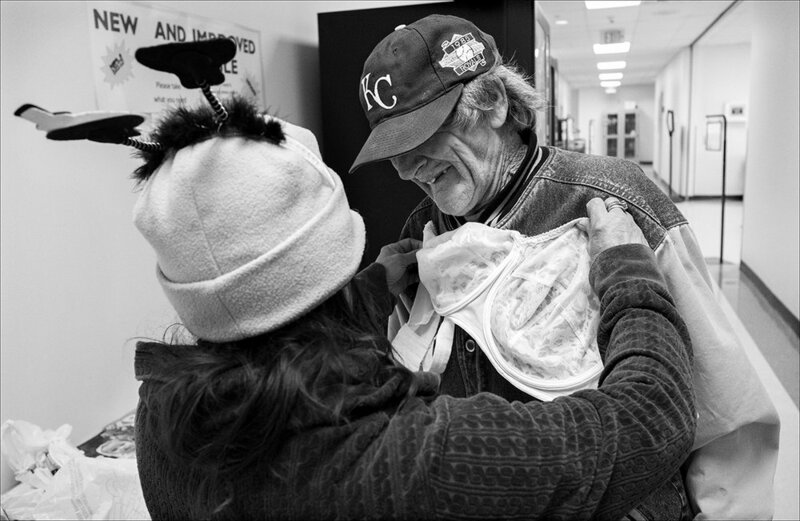 February 2017: Holding a bra up to Clarence’s shirt, Vickie jokes with Clarence, calling him an “old goat,” as the two look through items on the “free table” at the Quincy Senior and Family Resource Center. At times, the couple collects aluminum cans, even cashing them out for less than a $3 payday, to help pay for necessities when they run out of money before the end of the month. March 2017: Clarence zips up a jacket he bought for Vickie at a thrift store. Although Clarence owns only two pairs of pants and a couple of shirts, he occasionally buys Vickie nice but inexpensive clothing, toiletries, or other necessities for her out of his monthly retirement check. Many needed items are still out of reach. When Vickie’s purse was stolen with her glasses inside, she had to wait 11 months for replacement glasses. March 2017: Trying to escape the high cost of monthly motel room rentals, Clarence and Vickie found a rental trailer they liked but someone else had already rented it. The couple said when they complained about bed bugs at the motel where they rented a room for $500 a month they were asked to leave at the end of the month. Clarence then rented a room at another motel for $750 a month. Clarence said he checked into public housing, and said he would pay only $191 a month at the Lincoln-Douglas Apartments but there is a long waiting list. 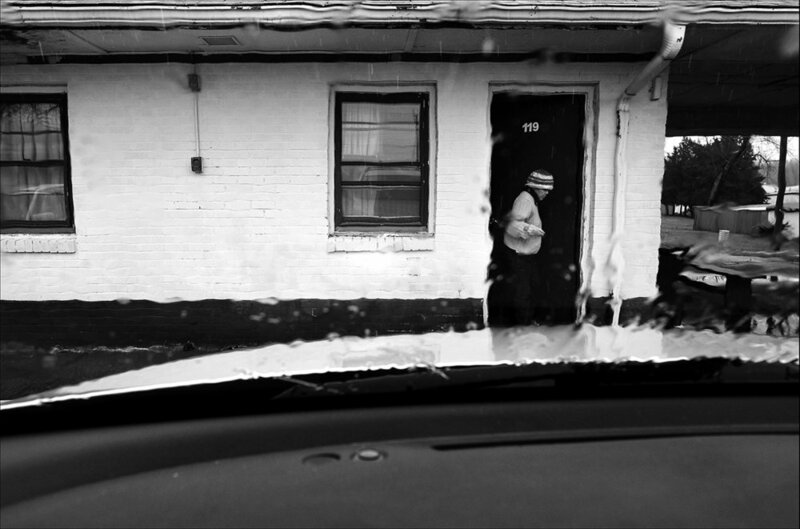 March 2017: Vickie stands in the doorway of the motel she and Clarence lived in for a month. 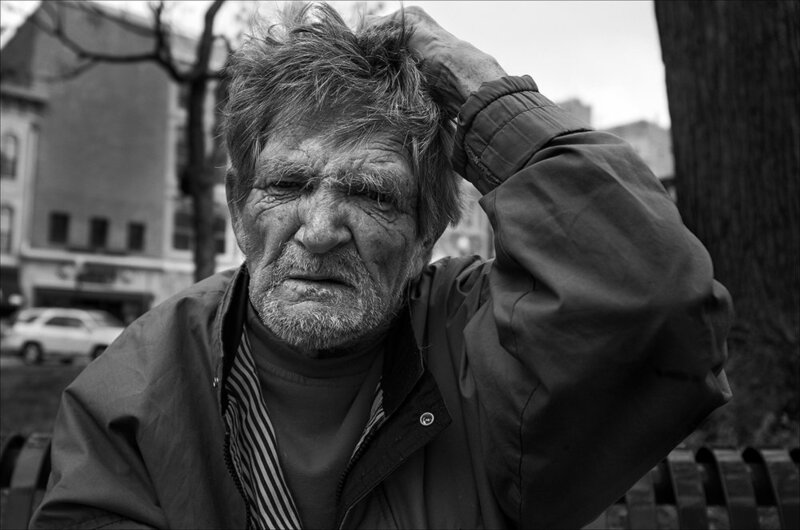 After finding bed bug bites on his scalp and body, Clarence asked for another room. Clarence said the manager then told them to leave at the end of the month. 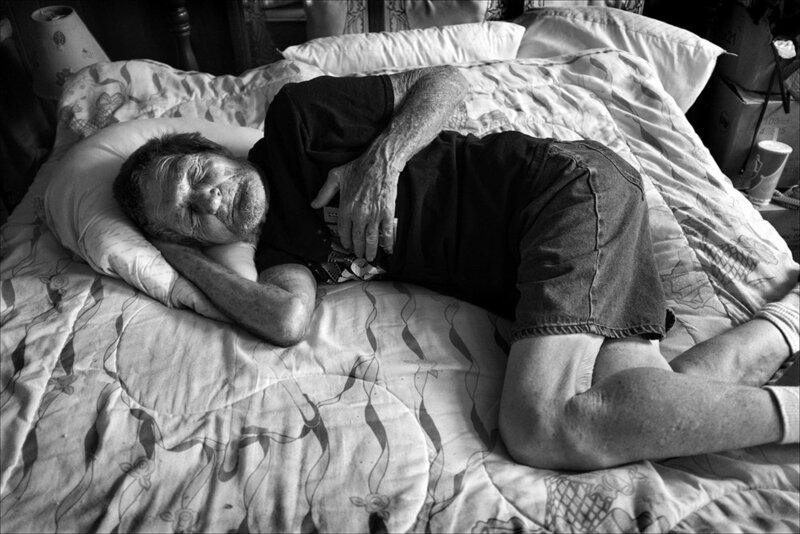 “I’m itching all night and I’m paying $500 a month," Clarence said. March 2017: Vickie washes up in the morning, as she and Clarence begin another day in the motel room Clarence is now renting for $750 a month. This cost doesn’t leave enough from Clarence’s monthly $930 retirement check to save deposits on a decent apartment. March 2017: Clarence and Vickie rest on a bench outside the $750-a-month motel. Vickie is carrying a bag of pastries she picked up at the Horizons Soup Kitchen. 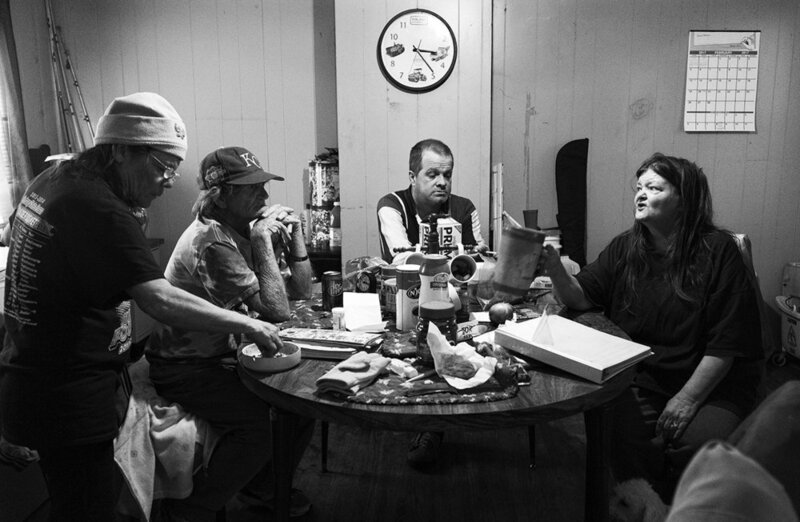 The couple rely on eating at the soup kitchen Monday through Friday and at Salem Church on Saturdays. April 2017: Clarence reaches out to help Vickie after she slid off the bed while putting on her shoes. A long-time alcoholic, Vickie is trying to apply for disability for leg and vision problems. She is still waiting for glasses and she needs lower dentures. Illinois Medicaid doesn’t pay for partial dentures, so she must get her remaining two lower teeth pulled before she can get the dentures. May 2017: Clarence and Vickie place ceramic angels from the Dollar Store on the grave of Vickie’s parents, and on the grave of Clarence’s son, Johnny. Clarence still struggles with the death of Johnny, who was only 18 months old in 1961 when a drunk driver swerved up onto a sidewalk, striking and killing the boy. “I miss him,” Clarence says. Desperate for information, Clarence and Brenda go to the Quincy Police Department to file a missing persons report. “They won’t tell us anything,” Brenda said. “They said she might have just met some new friends and left with them. Well, even if they are new friends, I don’t think Vickie’s the type who’d just get up and leave with them. Brenda and Clarence said they were offered no other assistance, or suggestions, so they returned home with no answers. 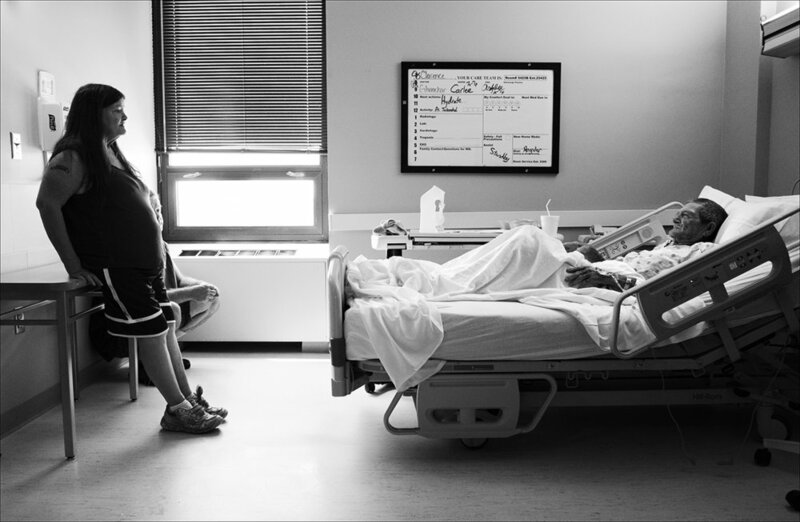 June 2017: Within weeks of not knowing anything about Vickie’s whereabouts, Clarence, depressed, is admitted to Blessing Hospital for dehydration. In July, Clarence is admitted to the hospital again. While there, Brenda says the nurses didn’t notice the change in Clarence’s blood pressure, which shot up to 201/115. “We were admitted to the hospital after being in the ER and waiting room for about eight hours,” Brenda said. By September, Brenda says Clarence was admitted to the hospital a third time with dehydration and pneumonia. “The doctor’s nurse called me and said Clarence was really confused. 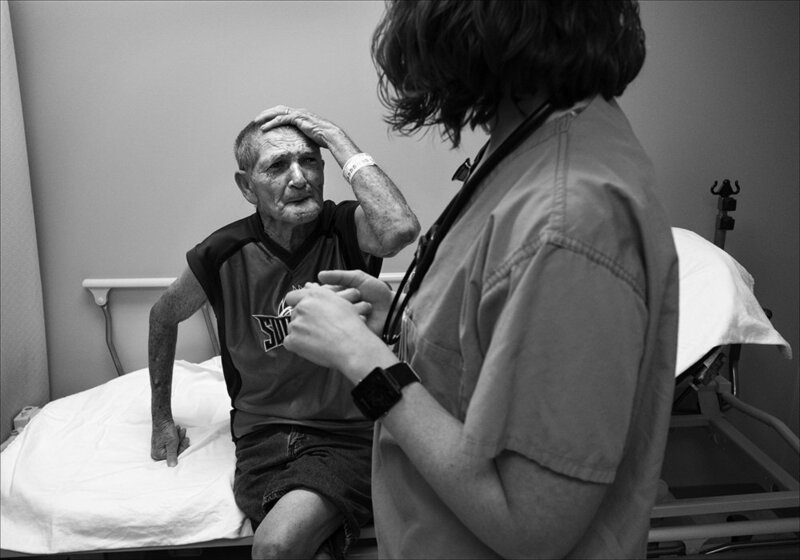 They told me he has dementia, then they found out he had a urinary tract infection.” By November, Clarence is admitted to Blessing Hospital again because of dehydration and confusion. After an argument with a social worker at the Blessing Hospital ER, Clarence, clearly disoriented, paranoid and confused, is admitted to the hospital and treated for dehydration. “With me not being able to find out anything from the hospital, I think it's kind of wrong, because here the woman was living with me for probably about a year, and then they just more or less shut me out of her life and I didn't like that. I wanted to be part of her life, so we was always helping each other and anything Clarence needed done, Vicki was right there to help him.” Brenda says she thinks what the hospital did was wrong. On Friday, July 20, 2017, Brenda notices Clarence is confused while at a local grocery store. Brenda says Clarence hasn’t been sleeping in the three weeks since Vickie was discharged from Blessing Hospital without information on her whereabouts. “His appetite just went down the drain. I’m really worried about his health,” Brenda said. July 2017: Minutes after learning that Vickie had died, Clarence retreats to his bedroom. “My heart stopped,” Clarence said. In the following weeks and months, Clarence slips into a depression leading to four hospitalizations in four months for dehydration. Clarence has spent every night walking about trying to find her only to end in tears. Unable to sleep, he barely eats. When he finally learned that Vicki has died, he responded that he did not want to live anymore. Clarence and Vickie were very close. Where you saw one, you saw the other. July 2017: Following Vickie’s death, Clarence learned of a son Vickie had named David who lives nearby in Taylor, Mo. The two met to share stories about Vickie. David gave this photograph of Vickie at his wedding to Clarence. “Vickie was my mother. Back when we were younger kids, she'd come get us roughly two or three times a year, maybe more, and do things with us. But we were usually at the bar playing pool, me and my brother, and she'd take us to the zoo and Six Flags, and stuff like that. But, then she'd quit coming around for years. Then, we moved closer, and I got back in touch with her and she got married and was doing great. She came to my wedding, and we'd stay in touch, and everything. She was doing fine then her husband lost interest in her, because of her drinking habit. So, she kind of drifted off. I'd still get in touch with her every once in a while, and then she would be gone. She didn't ask for nothing; didn't want nothing. But, I mean, after that, I got in touch with her seven years ago and we talked and then probably a year later she called me apologizing for everything that she did to us and wasn't there or anything,” David said. “Then, her sister called me,” David continued. “Two or three weeks ago, maybe longer, about her being in the hospital and they were putting her in a nursing home. After that, the next time they called me was when she had a heart attack. Then, they left everything pretty much up to me. The doctors called me on a Saturday and told me that she's still unresponsive for three days and had a little bit of brain damage and they probably didn't think she would come out of it because they asked me to take her off the ventilator, so I did,” David said. July 2017: Clarence searches for Vickie’s burial plot in Green Mount Cemetery in Quincy. He’s heard Vickie’s remains may have been placed next to her parents’ grave, but thus far he’s been unable to find her. “Clarence just sits on the front porch mostly. He cries every day, missing Vickie,” Brenda says of Clarence, who was very active before her death. 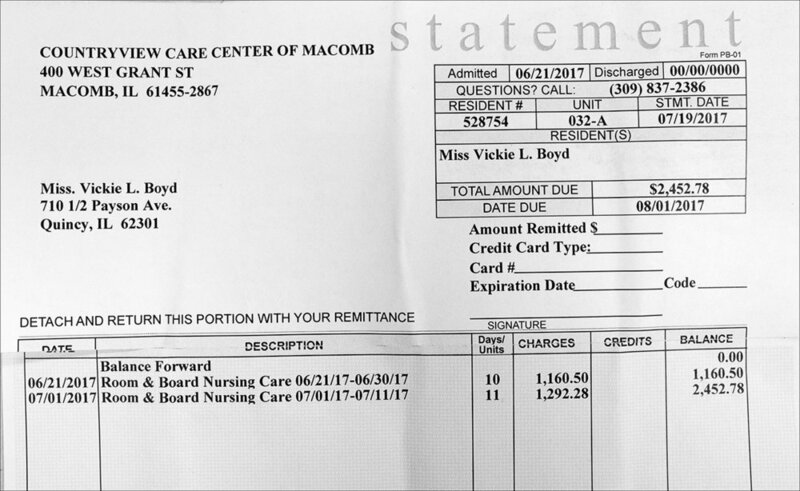 July 2017: Within weeks of her death, Vickie receives a bill for her stay at a nursing following her release from Blessing Hospital. November 2017: Clarence sits on a bench in Washington Park. He says he’s not sure where he is. Disoriented, Clarence is admitted to Blessing Hospital for the fourth time in as many months, because of dehydration. After an argument with a social worker at the Blessing Hospital ER, Clarence, clearly disoriented, paranoid and confused, is admitted to the hospital and treated for dehydration. November 2017: Clarence walks the fenced-in area at Sunset Nursing Home in Quincy. A psychiatrist at Blessing Hospital says Clarence’s disorientation (dementia symptoms) could easily be a temporary result of dehydration. However, Brenda and Ben have health problems of their own, making it difficult to take care of Clarence, so they ask about admitting Clarence into a nursing home. In his current state of confusion, Clarence believes people and institutions are trying to kill him. He’s constantly anxious. Because he was imagining people were trying to kill him, he stopped eating at home. Clarence went from 125 pounds in July, when Vickie died, to 97 pounds by November, only four months later. 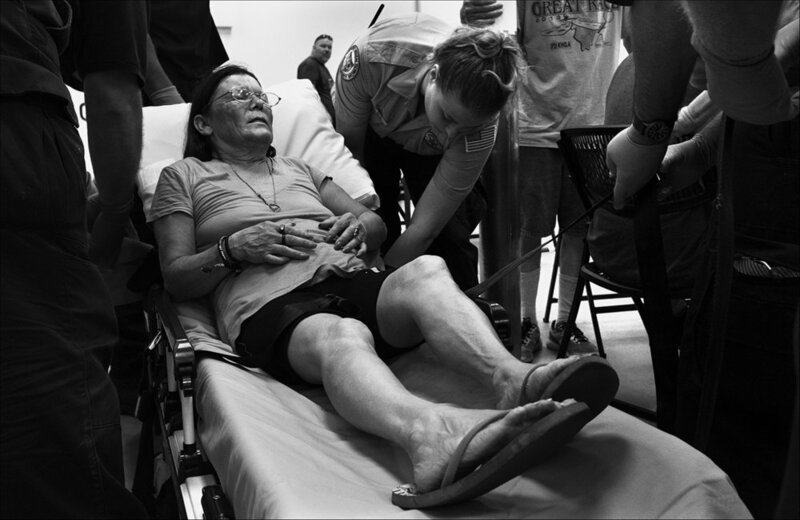 After nearly being placed into a nursing home far from Quincy by Blessing Hospital staff, against the family’s wishes, Clarence ultimately was admitted to Sunset Nursing Home in Quincy.